The Impact VW-VBG260EX Extender Battery prolongs the life of your Panasonic camcorder's VW-VBG260 lithium-ion battery. Simply mount the camcorder's original battery on the back of the VW-VBG260EX Extender Battery. It is mounted onto the extender battery only for the use of the chip information (no power will be drained), allowing the extender battery to function with the camcorder. 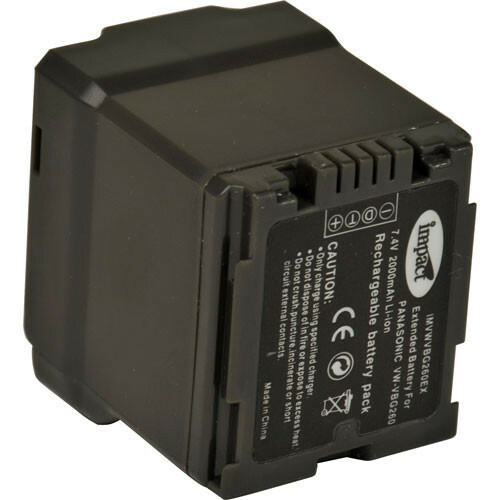 This extender battery is compatible with the following Panasonic camcorders that use the VW-VBG260 lithium-ion battery: HDC-SD9, HDC-HS9, HDC-SD5, HDC-SD1, HDC-SX5, HDC-DX1, SDR-H60, SDR-H40/41, SDR-H200, SDR-H18, VDR-D310, VDR-D50/51, VDR-D230, VDR-D220, VDR-D210, PV-GS500, PV-GS320, PV-GS85, PV-GS83, PV-GS90, PV-GS80.